This entry was posted in 子育て on January 14, 2005 by A2life. This entry was posted in 将棋 on January 11, 2005 by A2life. 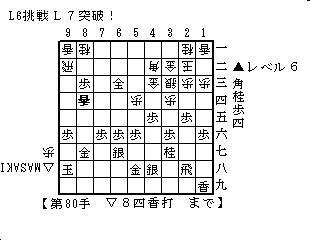 This entry was posted in 英語 on January 10, 2005 by A2life. This entry was posted in 日常 on December 17, 2004 by A2life. This entry was posted in 将棋 on December 16, 2004 by A2life. This entry was posted in RPN使い on December 14, 2004 by A2life. This entry was posted in 日常 on December 14, 2004 by A2life. This entry was posted in 日常 on November 27, 2004 by A2life. This entry was posted in 英語 on November 16, 2004 by A2life.